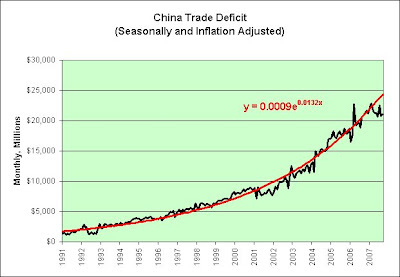 How Much More Inflation Can China Import from Us? "Sub-Prime Capital of the United States"
Laser-Faire is an economics theory devised a long time ago in a galaxy far, far away by the Dark economist Adam Sith. The theory postulates that all economic relationships must involve lasers in some way, and that invisible hands power the driving Force of economic booms and recessions. Known as "less is fair." An economist who never got around to writing a nine hundred-page thesis on economics developed this system, but his idea still lives on to this day. It involves "just going with it" and "stop worrying." This was an extremely effective form of economy in the late 90's as its main tenant was "no rules for anything, ever." The system collapsed with the election of George W Bush who used it just as intended, but perhaps a bit too much. Post inspired by a "lazy faire" comment left by abby something. 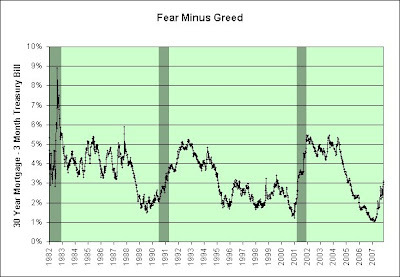 The bull market in fear minus greed marches on. This chart shows the 30 year year fixed rate mortgage rate minus the three month treasury bill rate. Shaded areas represent recessions. 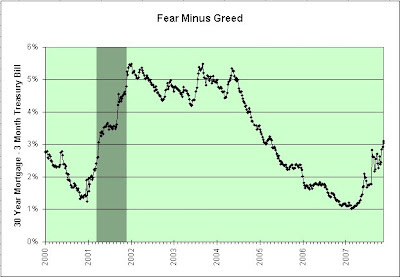 For a description of why I consider this to be a fear minus greed chart please see the close encounters link below. Here's a closeup. We reached a new local high yesterday (the data on mortgages that I'm using is only provided once a week, on Thursdays). 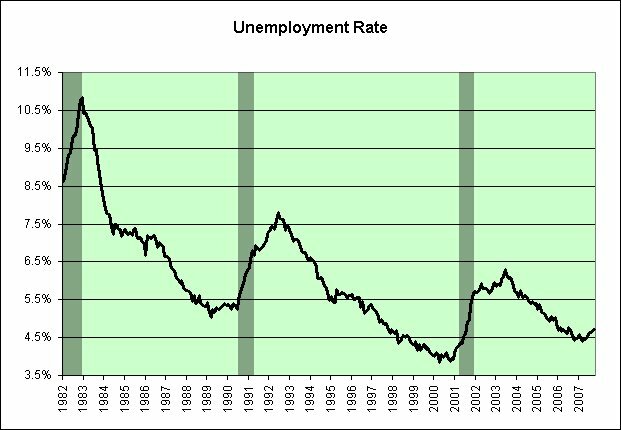 Here's a look at unemployment. I'm reasonably convinced that March of 2007 marked the bottom. If so, the fear minus greed "party" might just be getting started. Even so, the two biggest problems in these neighbourhoods remain. The first is the failure of the French economy to create enough jobs. Unemployment in what officialdom coyly calls “sensitive urban areas” is twice the national average; on the worst estates, it can hit 40%. Mr Sarkozy wants to loosen the labour market to encourage job creation, but negotiations with unions are still in progress. The second is the tense relationship between the police and local youths. France is hamstrung by a sterile debate between left and right over policing. The left insists that things have deteriorated since neighbourhood policing was dismantled, and blames the right for its more heavy-handed approach. Mr Sarkozy insists that earlier methods were too lax, treating policemen like social workers not law-enforcement officers. He prefers a strong hand to clamp down on criminality. How do you compete in a world where billions will work for less? Work more, earn more! Nov. 30 (Bloomberg) -- French President Nicolas Sarkozy said he wants to give companies the freedom to swap the end of the 35-hour working week for higher pay, aiming to spur economic growth without widening the budget deficit. The French president said employees should be able to work on Sundays on a voluntary basis for double pay. Employees in the public and private sectors should also be able to trade holiday time for cash, and he pledged to increase overtime pay for civil servants. He said he will back legislation pushing price cuts in large supermarkets, without elaborating. Sarkozy also said growth in rents will be capped by inflation rather than a construction cost index, saying this will halve rent increases. SHANGHAI: Electronic Data Systems, the second-biggest computer-services provider in the world, plans to increase its number of employees in China more than sixfold to increase profit through cheaper labor. "If you stay stagnant and you don't go off and do it, you're not viable as a company," Wirt said. "Employees will be impacted, there's no doubt about that, and I feel for them." Stick a fork in the cat herding business. It's done. Stagnation? Slowly-growing standards of living? Diminishing returns? Oh oh. I'd say this supports my death of real yields theory and 1970s mindset somewhat. Each of our sector teams covers a global client base in what are some of the most capital-intensive and rapidly consolidating industries in business today. It doesn't get much more capital-intensive than building a home for a worker, without the income needed to support it, requiring no money down, and then giving him a teaser rate to keep his intitial payments low. Just better hope that same worker isn't in the construction or banking business (the apparent lifeblood of this economy). I'm somewhat torn between the idea of cringing and throwing up (not that I really need to choose between the two if push comes to shove, as there will probably be plenty of time to do both). We had an undead scare (dead cat bouncing?) over the previous two days but we seem back on track to plunge to the bottom again today. Whew! We dropped from ~1.7% to ~1.6%. Before you know it there will be almost no way to protect wealth. Hurray! I don't know about you, but this certainly puts me back in a very musical mood. Feels like Hoover, combined with the 1970s lack of gold standard perhaps. Two wrongs make a right? Of course they do! Special Note: Spot the sarcasm in this post and win a special prize. Prize probably not worth the paper it is printed on though. Sorry about that! 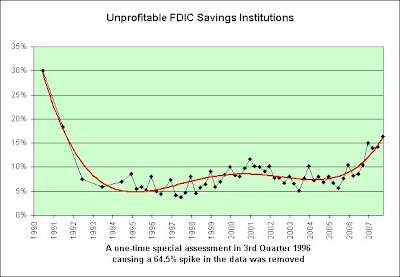 This chart shows the percentage of FDIC Savings Institutions which are currently unprofitable. I've included a 4th order polynomial in red as my eyeball analysis of the current situation. Don't read too much into it though. No crystal balls here! Dead cat bounce? Or is this the start of something different? I lean heavily towards the former but acknowledge that the latter is certainly possible. It is very difficult for real yields to fall when oil is tanking and the Dow moves up 500 points (in just two days). "Oil is a catalyst," he said. "It's running the whole show." It is right out of the exotic mortgage handbook! OLYMPIA — State lawmakers during a special session Thursday will consider helping struggling homeowners by letting households earning up to $57,000 a year defer part of their property tax. Okay, you still owe the money but you don't have to pay right away? Homeowners also would have to pay interest on the deferred tax. The interest would be based on federal rates. Gregoire said people would pay about 7 percent interest currently. People can't afford to pay today? The plan to help them involves charging them interest far exceeding their likely wage increases? Seriously? And why is the word "currently" used? Does that mean this interest is an adjustable rate? Perhaps our government doesn't fully understand the concepts of debt management. It is important to recognize that the Federal Reserve cannot resolve this price discovery problem. The markets will have to figure this out. Arbitrarily lowering interest rates or providing liquidity to the market does not provide the answers the market seeks. Indeed, in some circumstances, lowering interest rates may prolong the painful process of price discovery. It is also important to recognize that the Federal Reserve helped initiate the price discovery problem by sending interest rates to hideously low levels and then encouraging the use of exotic mortgages. The problem became most acute for those institutions or entities that relied on borrowing short and lending long (especially if lending long meant buying subprime mortgage portfolios). That's exactly what the Fed's intent was when they lowered short-term interest rates! Here, borrow some cheap short-term money and quickly loan it out!! Help us stop the deflation!!! Too bad banks didn't heed Buffett's warnings about being a short-term borrower or a long-term lender. They had 25 years to think about them. So here's a musical tribute from ELO's "Discovery" album aptly named "Confusion." This is a continuation of the previous Flow of Funds Fun! post. I have extrapolated the trend lines out to the year 2011. I thought it would be useful to see how long we'd need to stagnate in order to return to the mean. 2011 seems like a decent ball park estimate, assuming we started stagnating as of June 30, 2007 (the last data points in the chart above). Of course, once we start stagnating it might take a long time to stop. As seen in the 1970s, we don't necessarily have to stop just because we've hit the mean. Behold the flight [to quality] of the bumblebee! Let's just hope there's a chair still available when the music stops. Unless I'm mistaken, there doesn't seem to be all that many chairs. 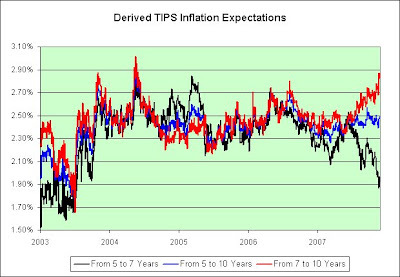 This shows the inflation expectations as derived from the treasury market (comparing nominal treasury yields and inflation adjusted yields of the TIPS market). Everything seems relatively normal, right? Wrong. Something is very amiss. 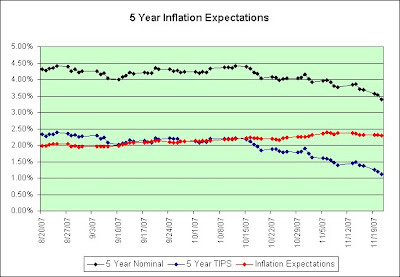 Why are the inflation expectations for 7 years well below the inflation expectations for 5 years and 10 years? 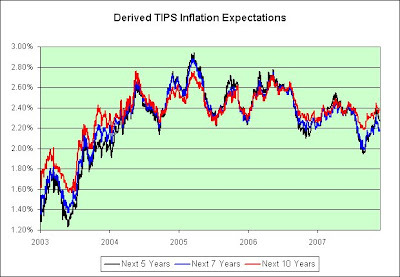 Since we know the inflation expectations for 5, 7, and 10 years as judged by the "all knowing" treasury market (said somewhat sarcastically), that allows us to calculate the inflation expectations in other time frames within those periods. What the heck is happening lately? Let's look at the next 5 years as seen in the first chart. That's running at 2.27%. 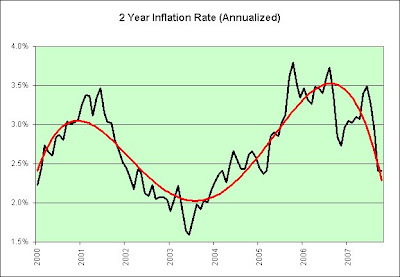 Then, from 5 years to 7 years the market is expecting just 1.92% inflation (as seen in the black line in the chart above). 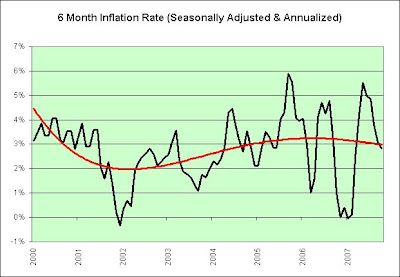 Finally, from 7 years to 10 years the market is expecting 2.87% inflation (as seen in the red line in the chart above). That's chaos and confusion. It would make no sense for the market to predict such behavior five years out. It has a hard enough time predicting what inflation will be even six months out, much less fine tuning its predictions 5 to 7 years out. So what is causing it? I believe I have an answer. Note the hump in the 7-year TIPS. The higher yield on the 7-year TIPS implies fewer investors want it. Why would that be? There is no 7-year TIPS auction! If we, as individual investors, decide we want to buy TIPS directly from the government we would do so primarily by participating in the 5-year, 10-year, and 20-year TIPS auctions. That tells me that individual investors are backing up the truck on TIPS and they are doing so directly (cutting out the middle men). That's exactly what I've done for the most part and it appears to be what others are doing. So what does this mean to us? If we were thinking of buying a combination of 5-year TIPS and 10-year TIPS, we might want to consider buying the 7-year TIPS instead through the secondary markets. What else does it mean to us? The Fed is increasing the frequency, expanding the time horizon and taking a broader view of inflation in its forecasts. It’s doing so in the name of transparency and in hope of managing expectations to better fit its policy prescriptions. Managing inflation expectations is at least half the battle, and there's a serious risk (based on the TIPS market) the battle might not be going their way. Growthcession. We may be witnessing the birth of a word — one that might take its place in the economic lexicon alongside the stagflation that defined an era three decades ago. If so, we may have to get used to it. Yuck is right. I have no great desire to change my name to Growthcessionary Mark. I suspect I'd need therapy (or at the very least, chemotherapy). We hit a new relative low on Monday in the 10-year TIPS real yield, but bounced off of it today (to ~1.58% according to Bloomberg, not shown in the chart, as there is a one trading day lag in the data I'm using). If the stock market continues higher, real yields will probably continue to move higher. If the stock market resumes its downward path (or simply stagnates), real yields will probably continue to decline. 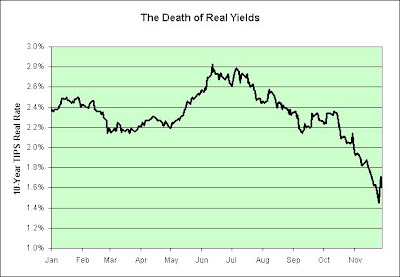 As a stagflationist, I'm firmly in the death of real yields camp, at least long-term. I could be wrong of course! Nov. 26 (Bloomberg) -- JPMorgan Chase & Co., the third- largest U.S. bank, named Barry Zubrow chief risk officer as the value of Wall Street firms' investments in subprime mortgages and related bonds tumbles amid credit-market turmoil. Chief risk officer? Maybe I'm just not remembering Star Trek all that well. Spock was the science officer. McCoy was the chief medical officer. Uhura was the communications officer. Scotty was the chief engineer. ``The chief risk officer function is a critical role for our company,'' Dimon said in the statement. Oh, I know why I can't remember. The chief risk officer is actually a security officer! They are the ones who beam down to the planet wearing the red shirts. Right? Citigroup, the largest U.S. bank, named Jorge Bermudez to replace David Bushnell as chief risk officer Nov. 16 after the company said as much as $11 billion in writedowns on mortgage- related investments may lead to the New York-based lender's first quarterly loss since at least 1998. We seem to be losing a great number of red shirts these days. I wonder what happened to David Bushnell? Bushnell is at least the fifth executive to be forced out or reassigned at Citigroup as this year's credit-market turmoil in the U.S. ravaged the bank's investments in subprime mortgages and related bonds. The company's board ousted Chief Executive Officer Charles Prince on Nov. 4, three weeks after Prince himself replaced three top trading executives. People need to stop beaming down to the planet. It simply isn't safe to lower the shields when the subprime drive is off-line and the ship is experiencing turmoil. JP Morgan Chase and Citigroup: To boldly go where no man has gone before! This chart shows the tangible assets, financial assets, and liabilities adjusted for inflation per person in the United States as seen in B.100 Balance Sheet of Households and Nonprofit Organizations within the Flow of Funds Accounts reports (through the 2nd quarter of 2007). 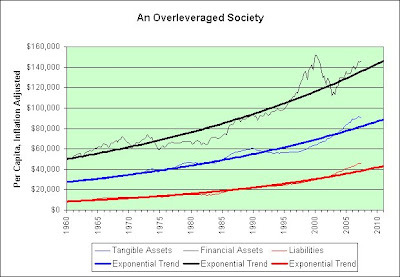 We're well above the long-term exponential growth trend in each and every one of these (which is rather unprecedented). What would happen if we revert to the mean? Tangible asset prices (adjusted for inflation) would fall. We're starting to see that in the housing market. It does not mean inflation would necessarily fall, just that housing prices relative to reported inflation would fall (since housing makes up the vast majority of tangible asset prices). Financial asset prices (adjusted for inflation) would fall. We're starting to see that in the stock market. Although returns are doing well in the bond market this year thanks to falling interest rates, those same falling interest rates may make it more difficult to earn interest in the future (once again, when adjusted for inflation). 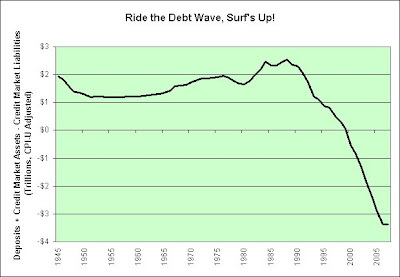 Liabilities (adjusted for inflation) would fall. We're starting to see that in the credit markets. Delinquencies are rising. 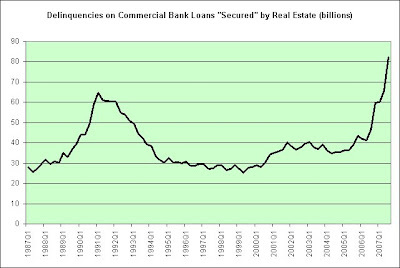 Lending standards have risen. The "b" (bankruptcy) word is becoming more popular. Bankruptcy has been a notoriously easy way to see credit fall. The debt simply vanishes with the stroke of a pen. 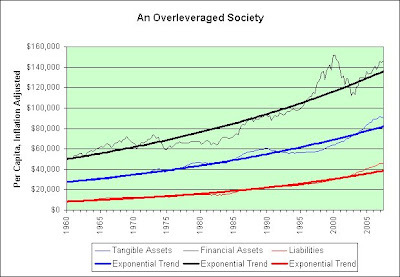 I'm suggesting that what we're seeing in the markets these days is exactly what we would be seeing if tangible assets, financial assets, and liabilities all return to the mean. 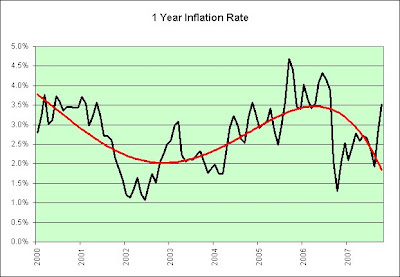 This is not an inflation vs. deflation argument though, since this analysis is based on inflation adjusted numbers. In other words, if you believe we will revert to the mean you do not have to choose between inflation and deflation. We'll get there either way. I continue to believe that real yields are dying and that it will be very difficult to make money on real estate, stocks, and bonds. It will also be very difficult for those in debt to borrow ever increasing sums of money. It's a lose, lose, lose, lose situation in my opinion. 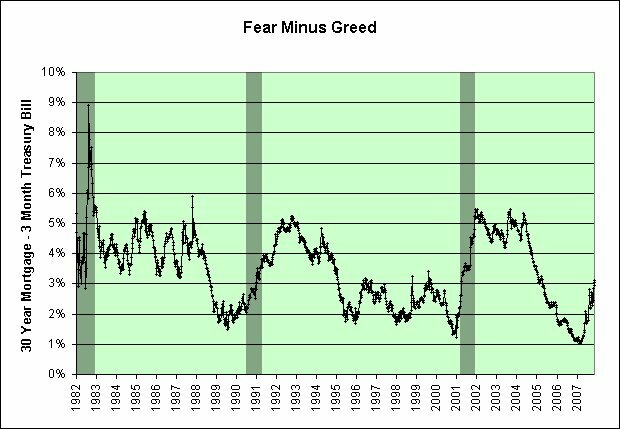 This will be in sharp contrast to the last few years which saw a win (real estate), win (stocks), win (bonds), win (cheap debt) situation. Am I pessimistic? I don't think so. Am I bearish? Absolutely. I'd like to think I'm being realistic more than anything though. I'm not shorting stocks. I'm not selling my house. I'm not hoping for this outcome. I'm simply waiting on the sidelines as best I can for a much better time to be bullish. That's all. I could be wrong of course and since I have nothing to gain if I am right, I'd be perfectly okay with that. This chart shows the yield on the five year inflation protected treasury and the yield on its non-inflation protected counterpart. The difference is also shown and represents the inflation expectations over the next five years (for both investments to pay the investor exactly the same). The starting point is August 20, 2007. That was "credit crunch" day. You would think that credit crunch day would cause a wave of short-term deflationary thinking (think Great Depression). Instead, the market seems to fear Ben Bernanke's technology. They didn't have such a magical and mystical device during the Great Depression of course. We were still on the gold standard. It becomes very interesting should the blue line reach zero, since that is the lowest it can possibly go. It also becomes very interesting if the black line meets the red line (meaning the five year treasury market is expected to lose money to inflation even before taxes). The march downward continues. TIPS (treasury inflation protected securities) do best during periods of stagflation, simply because they do best when real yields fall. It does not matter why real yields are falling. It could be because interest rates are coming down faster than inflation or it could be because inflation is rising faster than interest rates. 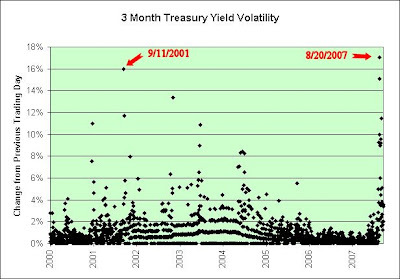 The yield on the 10 year TIPS is nearing the 2004 low. Part of me is thinking of profit taking. Part of me is thinking the aftermath of the housing bubble will be far worse than the aftermath of the dotcom bubble though (in inflation adjusted real terms anyway). Therefore, I am still comfortable holding. TIPS didn't exist in the 1970s. Real yields on non-inflation protected treasuries were negative though. 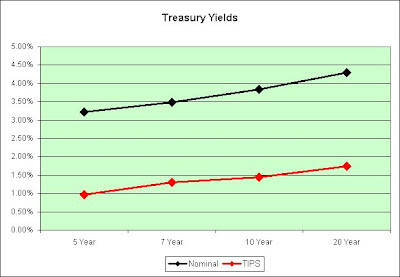 It is conceivable that the yield on the 10 year TIPS could actually reach zero should our economy continue to stagnate. Zero is the lowest it can go as seen in the Treasury Marketable Securities Tender Instructions (and we're well over one third of the way there already). Note that you will still lose money to taxes though. The government wants its cut in good times and bad. Should inflation reach 10% you'll be earning 10% (but also paying tax on that 10%). Of course, if inflation hits 10% you could probably be doing far worse (if the 1970s are any indicator). I'm working under the assumption that we're in a bear market and that the goal is to simply lose less money. How's that for pessimistic? I-Bonds are yielding a real rate of 1.2% and will continue to do so at least until May, 2008 (once you buy the I-Bond that real rate is locked in for as long as you own it though, up to 30 years). 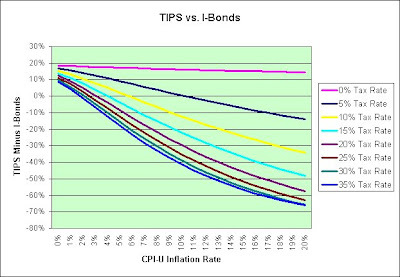 As the TIPS rate falls, the I-Bonds become more and more attractive by comparison (since they are tax deferred). Further, should real interest rates climb higher you can always sell the I-Bonds (without taking a loss, unlike TIPS) and reinvest at the higher rate. This chart shows the total real return difference between the 1.61% 10-year TIPS continually reinvested (at that same 1.61% for 30 years, assuming interest rates held steady) vs. the 1.2% I-Bonds (held for 30 years) depending on the tax bracket. It is an update to a chart I've done previously. As can be seen, the TIPS should do better than I-Bonds if inflation stays tame (big if!!) and/or you are in a relatively low tax bracket. I have no crystal ball on where real interest rates are heading next. If I knew for certain, I wouldn't be sitting in TIPS. I'd either be hoarding hard assets (gold and silver) or shorting hard assets (or at the very least selling my house and renting, which has at times crossed my mind). In any event, this is certainly not investment advice. THE use of old-fashioned price controls to fight inflation is causing road chaos in some parts of China as speculators hoard fuel and refineries send their product overseas. Fuel hoarding is so 1970s, but then again so are old-fashioned price controls to fight inflation. 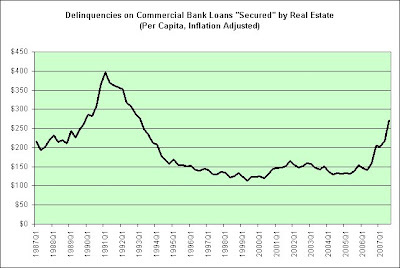 This data is seen in the "Delinquencies/All Banks" section and the "Asset quality measures; Delinquencies on all loans and leases; Secured by real estate; All commercial banks (End of period)" column. This shows the delinquencies per capita and adjusted for inflation. 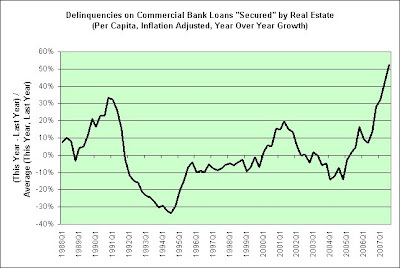 This shows the growth in delinquencies year over year. Even the growth rate is turning parabolic. Ouch! Update: I added a few charts to better show what's going on (Thanks CR!). As a measure of our global economic angst this is certainly striking. Credit Suisse have done some research looking at the incidence of the terms “stagflation” and “recession” in news stories. Their results suggest mounting anxieties on the former, while recession fever has yet to take hold. I'd say that on average the voters in my poll (thank you!) have nearly equal anxieties between stagflation and a disinflationary recession. I'm a fence rider between the two for the most part (as you may recall). About all I really expect is that real yields continue to fall. I'm using the theory that in a fiat currency system, strong economies generate high real yields (1980s and 1990s) and weak economies generate low real yields (1970s and 2000s). I'm also under the impression that we've simply borrowed this recovery and that the downturn we are seeing now is just a continuation of the dotcom crash from which we never did truly recover. The monetary printing presses offered up a rather convincing illusion though (by devaluing our currency so that all assets rose in price). However, there are now serious cracks in the facade. You...I think that you got the blues, too. Now you can see crashes before they happen. And have up to 2 days lead-time to prepare for them. Because IBM® System x™ has built-in Predictive Failure Analysis®. It’s innovation made easy. I wonder if there is a banking system version. The report forecasts that transportation costs would increase notably in November and December which in turn, would lead to price hikes of non-foodstuffs, given increased gasoline and diesel prices by 500 yuan (US$67) per ton. According to the report, quick and substantial RMB appreciation would cut domestic enterprises' profit margin greatly and hurt domestic banking and capital market, with possible numerous bankruptcies. That's what we've got. We're stuck between a rock and a hard place as the importer, and they are stuck between a hard place and a rock as the exporter. The Pollyanna economists think it is all different now, a view espoused by the World Bank in its most recent report on East Asian economic growth. China is creating its own demand, “decoupling” from the US economy, it says. In my opinion, the global economy has never been more coupled than it is right now. This chart shows the total profits (before tax) of the domestic financial, farm, and non-financial corporations as seen in Table F.7 Distribution of National Income in the Flow of Funds Accounts adjusted by the CPI-U and by the population. I've just got one thing to say about the chart. 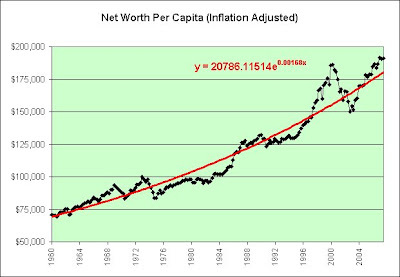 If anyone tells you that the bursting of the dotcom bubble has ushered in a new permanent (sustainable) era of prosperity for us then be sure to ask for a nice refreshing glass of Kool-Aid as well. I'm just not so sure I'd be drinking what they have to offer. Look out below if that ever reverts to the mean (which most things do). 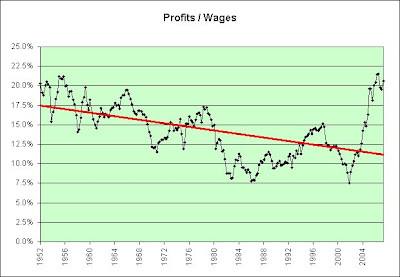 Further, real corporate profits have not kept up with compensation (until the bubble burst that is). This chart shows the total compensation of employees adjusted by the CPI-U and by the population. Since income inequality has been shown to be growing (as seen in the Gini Coefficient), I would argue that the top end of the pay scale is pulling up the average. Our financial center, New York, is leading the charge (pun intended). These charts inspired by a comment left by kwark. Sustained weakness in corn, soybean, and wheat prices is not expected in the near term as supplies remain tight and demand is firm. Tight world stocks will continue to magnify the impact of production uncertainty into the foreseeable future. Volatility in energy and currency markets will also add to the volatility of crop prices. Risk has increased significantly. U.S. exporters reported sales of 1.296 million tons last week, twice as much as a week earlier and the highest weekly sales since the marketing year began Sept. 1, the U.S. Department of Agriculture said Friday. China, the biggest importer, accounted for 71 percent of the total the previous week, plus a new sale of 226,000 tons reported Friday. Forget the focus on China’s currency, inflation and rising food prices is the most important element in its economy right now. With pork an important part of the Chinese diet, its price is a key marker in the general public's perception of inflation. ''I cannot afford to eat pork in this Year of the Pig'' is a topical local joke - and not necessarily a funny one. "Food is still the primary force driving prices upward, although in a poor country where one-third of the CPI basket is food, I would think that rising food prices must affect wages and, through wages, the rest of the economy," said Michael Pettis, a finance professor at Peking University. The same goes for higher oil prices, which can only be dismissed for so long. When crude oil hit $50 a barrel, analysts told investors not to worry. Similar noises are being heard as oil approaches $100 a barrel. How much longer can economists and investors live in denial that commodity prices will eventually filter into economies? This chart shows the total profits (before tax) of the domestic financial corporations divided by the profits of the domestic financial, farm, and non-financial corporations as seen in Table F.7 Distribution of National Income in the Flow of Funds Accounts. The red trend line is a rather useless 6th order polynomial to show the trend my eye seems to see (and biased somewhat by the recent headlines my eyes seem to read). 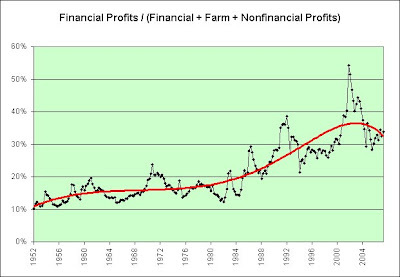 This chart shows the total profits (before tax) of the domestic financial, farm, and non-financial corporations divided by the total compensation of employees. That's rather unprecedented. It's almost like we were printing our way to prosperity as a reaction to our dotcom bubble bursting. Yeah, well, like that was going to work. Rather than take the medicine we deserved, we opted instead for the "something for nothing" malinvestment stew. Yum, tasty. 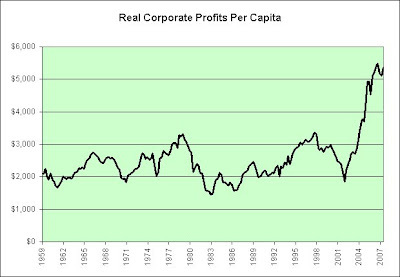 The first thought that goes through your head when looking at this chart is probably "Greedy corporations!" However, that's not the thing driving this chart in my opinion. If so many profits were being made and it was sustainable, there would be extra incentive for other corporations to make profits too. Eventually competition within a capitalistic society would rebalance things (paying more for workers and/or having profits come down to more reasonable levels). Picture a coffee chain. Let's say you are making a lot of money selling coffee. What do you do? You get caught up in the wave of high profits and you expand. More businesses see your success and start making coffee products too. At some point, the nation is engulfed in coffee chains. 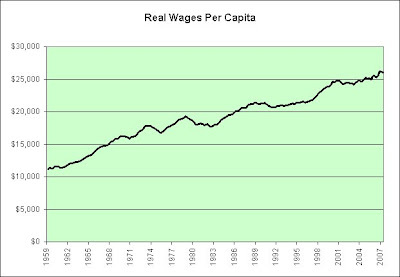 As long as profits are so high in relation to wages, there's no reason to stop expanding. Right? So what can go wrong? At some point the market becomes saturated and profits revert to the mean. The traffic decline may be a sign that the Seattle-based company is starting to feel the effects of heightened competition and oversaturation, with a Starbucks seemingly on every other street corner. I'm not going to end it here though. As seen in the first chart, I think we've got way too many banks. How many times do you open up your mail to see a credit card offer? Just how many more credit cards do we really need? I think we've also got too many houses, which is becoming all too apparent. These are just symptoms though (rather nasty ones at that). By using unprecedented cheap money in the aftermath of the dotcom bubble, we've created one heck of a malinvestment stew. I once read (and I wish I could quote the source) that in the beginning of a great monetary inflation everyone wins and nobody pays. In the end nobody benefits and everyone pays. I think we're well past the nobody pays point. This is once again not investment advice. I'm just a random anonymous blogger on the Internet trying to make some small sense of how we got here and where we are headed. The Port of Los Angeles has released the shipping traffic for October. 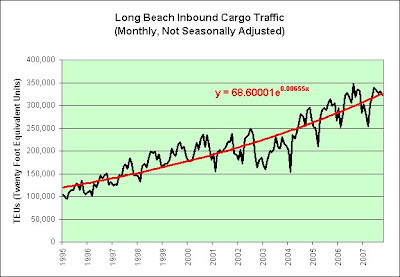 I've combined that data with the Port of Long Beach in the following charts. Inbound traffic continues to deteriorate. Perhaps it is time to stick a fork in the consumer. I think we're done. 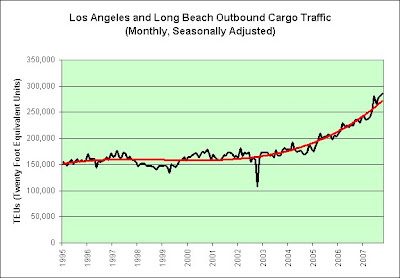 Outbound traffic is really picking up. Overall trade is stagnant this year. Our trade situation is improving (thanks to our dramatically weakened currency and possible recessionary inbound traffic). Update: I have updated the charts with quarterly data. 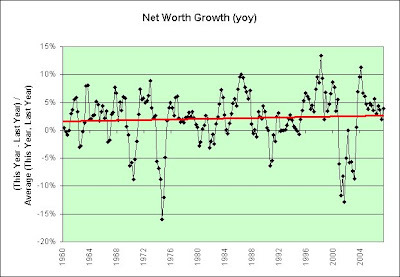 This is a chart of the net worth as seen in B.100 Balance Sheet of Households and Nonprofit Organizations within the Flow of Funds Accounts reports (from 1960 to 2nd quarter 2007). I have adjusted the numbers for both population and reported inflation. Yet another "toppy" chart. In my opinion, we're heading back up for the hair of the dog that bit us. Perhaps that's just me though. Can we walk the tightrope or will we fall? I heavily suspect the latter. 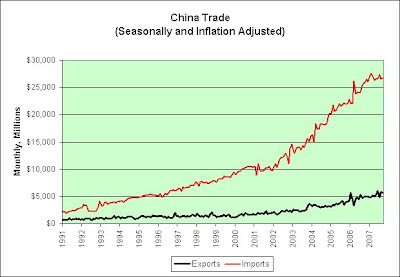 This chart shows the exports to China and imports from China as seen in Exhibit 14 of the U.S. International Trade in Goods and Services reports. I adjusted the amounts by our CPI-U and then seasonally adjusted them. It's looking more than a bit peaky on the import side. This chart shows the difference between the imports and exports. I guess exponential growth at 1.3% per month wasn't sustainable long-term. Who knew? 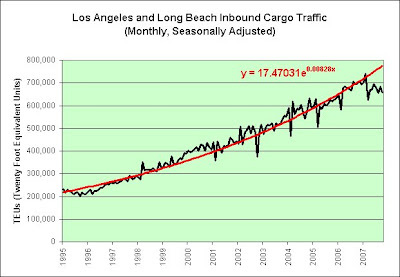 It appears to be breaking just like the combined Long Beach and Los Angeles Cargo Traffic chart (from the link below). So what does it mean? Europe, you are next. We appear to be done. Sorry about that. With the strong euro, you can buy plenty of stuff from China. Now all you have to do is figure out who will buy your products. We can't even afford to buy products priced in our dollars it seems (as China is still pegged to us), much less euros. Further, it seems you have some extra headwinds to think about. Economic activity across Europe is likely to have been hit by the higher financing costs resulting from the credit squeeze. At the same time, a significantly stronger euro and the delayed effects of higher European Central Bank interest rates since the end of 2005 are also likely to have acted as a brake on growth. More recently, a pick-up in inflation would have eroded consumer spending power. It has been said that the road to every recession is signposted "soft landing". The end of this economic cycle looks like being no exception, even if the terminology is slightly different. This year's wishful thinking is dressed up as Goldman Sachs's "happy handover" or the ubiquitous "decoupling". Forgive me for not investing in you. Welcome to the "decoupling" party. Good luck on that one. 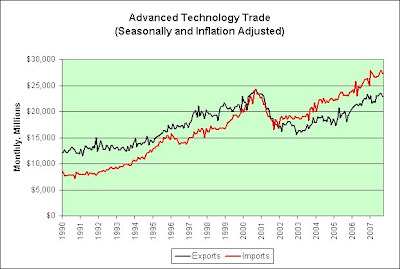 This chart shows the imports and exports of advanced technology as seen in Exhibit 16 of the U.S. International Trade in Goods and Services reports. I have adjusted the amounts by our CPI-U and have seasonally adjusted them. It seems we're fully back on board the advanced technology rocketship, again. And when I say we, I might even mean the rest of the world, since their rocketship seems to be coming our way. In fact, I'm tempted to start looking for the advanced technology rocketship in Wal-Mart. 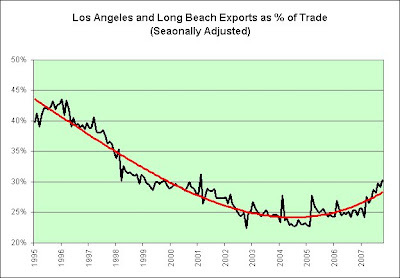 This chart shows the difference between our imports and our exports (as seen in the previous chart). 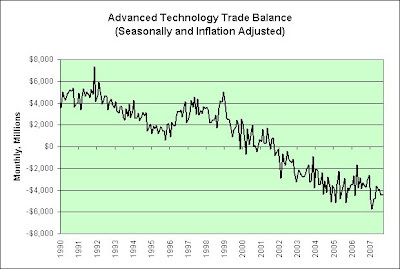 It seems the falling dollar hasn't done much to close the trade deficit when it comes to advanced technology, but the rate of decline appears to be slowing. I suppose that's something. 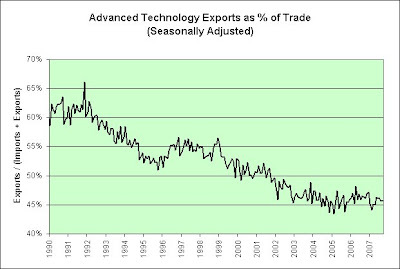 This chart shows the percentage of our advanced technology exports as a percent of the total of our advanced technology trade (imports + exports). Exports are picking up. The trend line is a 3rd order polynomial. Although our imports slowed dramatically, our exports picked up. The overall traffic is hanging in there. Our weakened dollar is working to improve the trade deficit. 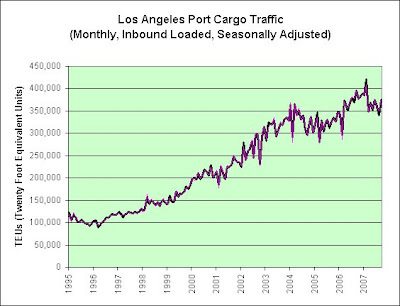 This shows the trade in terms of actual loaded containers (but not the price of the contents). Here's our fastest growing exports (in items of $500 million or more) from August to September (change from previous month, not annualized) as seen in Exhibit 7 of September's FT900: U.S. International Trade in Goods and Services report. 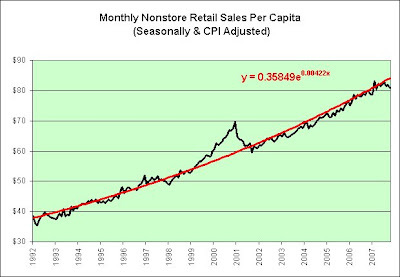 That looks very inflationary to me (at least for us as shown in our future CPI). However, here's the list at the other end of the spectrum. That looks very deflationary. Why are gold and nonferrous metals (copper is a vital industrial metal) leading the list? What's telecommunications doing on the list? Might be time to check the headlines for telecommunications. LONDON (MarketWatch) -- Investors are moving out of the European banking sector and into telecom stocks in an effort to keep yield levels high and safe in current volatile market conditions, fund managers and portfolio strategists say. So let me get this straight. Investors presumably lost money in the banking sector by chasing high yields and safety. They are now piling into telecom stocks for high yields and safety. Perhaps high yields and safety are not compatible with each other. Just a crazy theory of course. 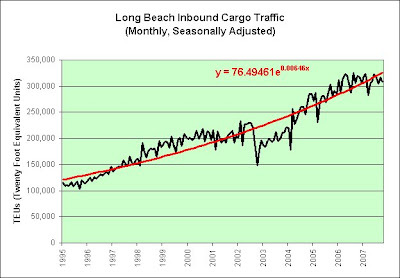 Here's the Long Beach inbound traffic through October, 2007. That's looking fairly stagnant lately. Something clearly happened in 2002 though. Here's the story. LONG BEACH, California (CNN) -- The Pacific Maritime Association said Sunday it had reinstated its lockout of workers at all 29 West Coast ports at least until Monday because of a labor dispute with union workers. 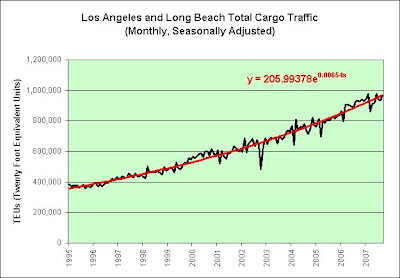 Here's the combined traffic into both ports through September, 2007 (still awaiting the October numbers from the Port of Los Angeles). I think the combination paints a more reliable picture of what is going on. 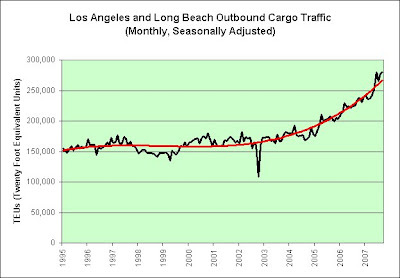 There's definitely a slowdown at these two ports. The Census Bureau provides a tool which creates seasonally adjusted data. It spits out an impressive amount of information when you run it (page after page of data analysis). The thick black line was my attempt to seasonally adjust the data. The tool generated the thin purple line (using the default settings). I know just enough about the tool to be dangerous now, lol. I will say I trust the seasonal adjustments from the government more than I once did. I also trust the tool enough to value its data more than my relatively crude attempt and will be using it in the future. You can see the thinking behind my seasonally adjusted attempt in the link below. 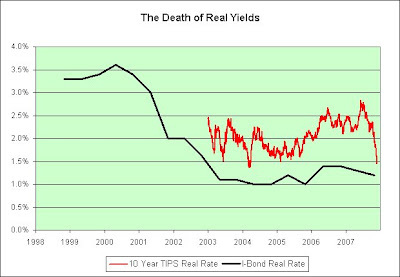 TIPS perform well when real yields drop (since you are locking in a real yield when you purchase them). Stagflation and falling real yields are all part of the same story to me (the real yields in the 1970s were negative as inflation took its bite). In order for Ben Bernanke to help the economy, he needs to force us to spend. He does this by lowering interest rates to the point we can't make money on savings. That's where I think we're heading again. I could be wrong of course. Treasury real yields aren't the only ones which can suffer during stagflation. "The third quarter was one the market would soon like to forget. Consumer Discretionary earnings fell 38.9%, Financials earnings plunged 33.1%, and overall earnings for the S&P 500 declined 8.48%," says Howard Silverblatt, Senior Index Analyst at Standard & Poor's. Silverblatt notes that if homebuilders (CTX, DHI, KBH, LEN and PHM) and General Motors (GM) were excluded from Consumer Discretionary (which represents 8.8% of the S&P 500), the sector would show a 4.2% gain for the quarter. If ifs and buts were candy and nuts, we'd all have a Merry Christmas. You know an article is somewhat bullishly biased when it doesn't offer similar things to exclude from the bearish perspective. In other words, you don't see me suggesting that we strip out Health Care's 14.8% year over year gain to make things look even worse, now do you? Well, one reason might be that the 14.8% year over year gain in Health Care earnings actually scares the living daylights out of me (especially if I extrapolate out a few decades)! So perhaps I am (bearishly) biased too. Here's a long-term TIP fund chart (keep in mind it pays interest). Real yields are fairly low now and TIPS have had a fairly good run this year. If I am wrong to like TIPS, I could be wrong in a spectacular way. As I have said previously though, I'd prefer to be wrong. That would mean real yields are rising. It would also mean that my nest egg would have a better chance of keeping up with inflation in the long-term. There would be pain in the short-term though (since TIPS perform poorly when real yields rise). This is most certainly not investment advice. That's looking just a tad stagnant lately for the nonstore retailers (online retailers are included in this). Can we get some sort of confirmation? MEMPHIS, Tenn. (AP) -- FedEx Corp. cut its earnings expectations for the fiscal second quarter and full year, citing soaring fuel costs and a troubled U.S. freight market. Oh oh. Apparently we can. 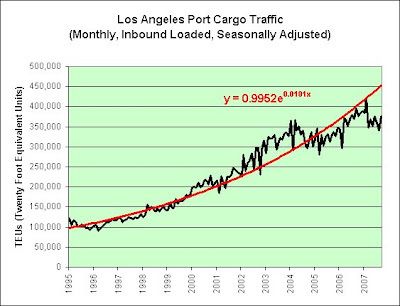 Here's an attempt to seasonally adjust the Port of Los Angeles inbound cargo traffic using the data from 1996 to 2006. I took a given month's traffic and divided it by the average of the 12 months around it (5 1/2 months on each side plus the month itself). I repeated this process over the years and came up with the following seasonal adjustments (and used them to create the chart below). I'm fairly comfortable with them, but they are hardly locked in stone. July through October are clearly the big months for imports. We've seen three of of the four so far and they are all down year over year (in Los Angeles anyway). The data for October is due to be released soon. I'm not all that optimistic things will be looking better. I think it is relatively safe to say we aren't growing our container import traffic through the Port of Los Angeles at a rate of 1.01% per month any longer (sorry China!). 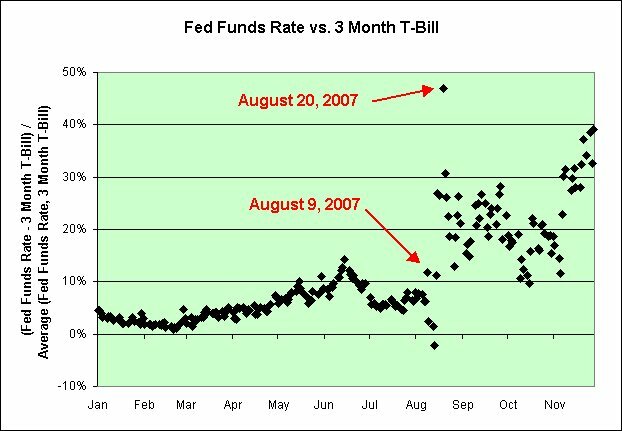 We made a valiant effort to restart it in 2004 by continuing to keep interest rates phenomenally low (note how 2005 through 2006 follows the line again), but alas, all that nearly free money seems to have broken something. I suppose we can try to restart it yet again by devaluing our currency even more, if we like the thought of $200 oil that is. Maybe we do. The larger worry is that the Bush Treasury, and perhaps Mr. Bush himself, seem to have fallen for the notion that a country can devalue its way to prosperity. This is the patent medicine of the manufacturers' lobby, as well as the kind of economist who has done so much for Argentina, Mexico and other nations over the years. Britain tried this in the 1970s, and had to call in Margaret Thatcher to save the country from sinking to Third World status. The Carter Administration also tried talking down the dollar and ended up inspiring a global run on U.S. assets. 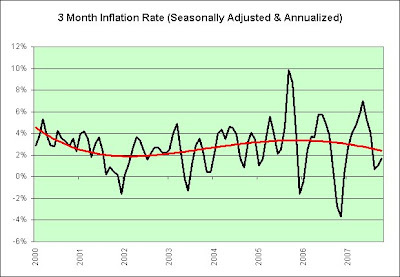 Update: I was not including the current month's data in the denominator when calculating the seasonal adjustments. I should have been since I was trying to see how far each month was off of the average. I've therefore updated the seasonal adjustments and the chart with this correction. This is the same data in my previous post but presented in a different way. Take all the savings (in the form of deposits, treasuries, corporate bonds, and so on) and pay off all the debt (mortgages, credit cards, ...). What's leftover? Not much lately. It's like a nasty millennium party gone awry (note the year when it turned negative). Now we're working at propping up the hangover. Bottoms up! Better hope people don't have to start dipping into the stock market (stock equity withdrawal?) and/or the housing market (home equity withdrawal?) to fuel the difference at some point. You know, like when the baby boomers start to retire. This isn't investment advice of course. I wouldn't even know what to say. This shows the total credit market instrument liabilities (mortgages, credit cards, ...) divided by the total deposits and credit market instrument assets (treasuries, corporate and foreign bonds, ...) as seen in table B.100 Balance Sheet of Households and Nonprofit Organizations within the Flow of Funds Accounts of the United States. This also shows the stock market (as represented by the Dow Jones Industrial Average and adjusted for inflation). 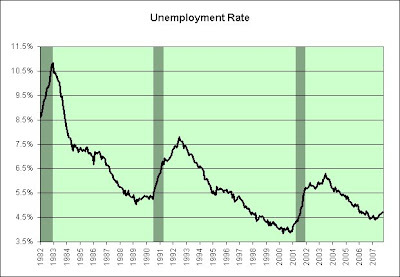 This data is current as of the 2nd quarter of 2007. A lot has happened since then though. 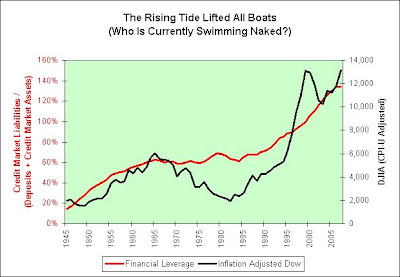 Note what happens if leverage ever stops increasing (much less falls). What might cause that? Oh, I don't know. Maybe a credit crisis would do it. As seen on Yahoo's website, historical chart data and daily updates provided by Commodity Systems, Inc. (CSI). Disclaimer: Yahoo provided a spreadsheet download link so it is fairly clear that I was free to download the data. Since I am not actually sharing the raw data and I am crediting the sources, I am assuming that I am not infringing on anyone's copyright. The CPI was released today. Here's an update. Not much to see in the three month chart. It's been relatively tame lately. I doubt the rising price of oil and falling dollar will be kind to it in the near-term. Who knows though? Christmas might be looking a bit ugly. Not much to see in the six month chart. 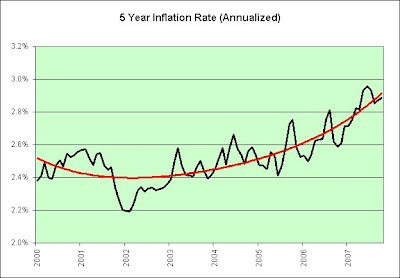 Inflation is running a bit warm but might have some favorable comparisons soon. The one year chart is now lined up perfectly with last year's commodity selloff. We apparently didn't get one this year. Trend line, you lose! Oh well! You can't trust them anyway. They are just lines after all. Okay, now this is the one that concerns me. Inflation trends and the expectations that go with them (once established), are a "bear" to break. All the rest is just fluff to me.